Come celebrate thanksgiving with Brewerkz! This thanksgiving, come and enjoy some hearty butternut squash soup, roasted turkey and brown butter mashed potatoes with the company of your loved ones at Brewerkz Riverside Point. We have prepared a wide selection of cheese, meats and even desserts satisfy you and your loved ones. Buffet priced at $55++ per adult and $14++ for children 12 years old and below. Buffet comes with FREE FLOW of soda, coffee & tea! 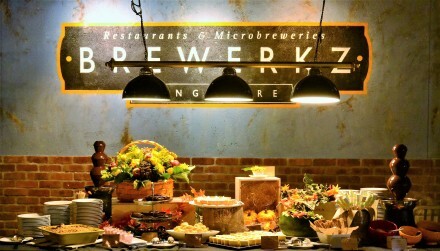 All Brewerkz draft beers are all at Happy Hour prices throughout the Buffet! Ala carte menu is available to order for guests who fancy a little bit more. Click here to see our full Thanksgiving Buffet Dinner Menu. NOTE: Online ticket sales has closed. Strictly valid for dine in only at Brewerkz Riverside Point on 22 November 2018. A valid printed confirmation ticket must be presented upon seating. Tickets are based on a first come first serve basis. Each timeslot will last for 3 hours, first seating 5pm-8pm, second seating 8pm-11pm. Diners from the first time slot have to leave by 8pm, changing of timeslots on the day itself is not allowed. Thanksgiving dinner buffet line will be cleared at 10.30pm. Buffet prices quoted are subject to 10% service charge and 7% GST. Tickets purchased are non-refundable nor exchangeable with another ticket type. Any a la carte drinks or additional beers or wines on top of package will be based on normal menu pricing. A la carte food menu is not available. Buffet food cannot be packed if unfinished. All alcohol and drinks are to be consumed on the said event day. Not valid with other discounts, vouchers, promotions or privileges.